I wrote once before about experiencing acne from Hair Shampoo or Conditioner. It was a horrible experience which led me to be very careful and wary about changing new hair shampoos and conditioners. One commentator said that it might be attributed to the Sodium Lauryl Sulfate in the product which I thought possible, yet strange because I’d been using products with SLS all my life. 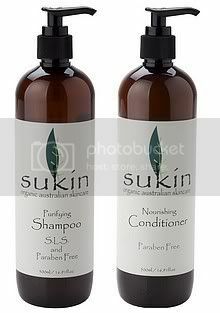 However, since Sukin Organics has a shampoo and conditioner with no SLS and Parabens in their formula, I decided to pick up a set in Singapore to try. Can ingredients in hair products cause acne? I’d been battling a losing battle with blemishes and acne for the past month and a half. I’d never really had perfect smooth skin but I’d stopped getting breakouts too. I’m getting too old for having a face full of acne! So, I was at quite a loss last month when my whole face inexplicably broke out. Not only was I getting hard painful acne, I was also getting lots and lots of bumps under my skin which were horrid. My forehead, where I don’t get many spots, was a mess as were my cheeks. I initially thought it was a skin product I was trying out so I stopped using it. Instead of going away, I kept getting one bump after another on my skin and it really bugged me. That was until I was reading some reviews online and came across a user of Tresemme hair conditioner who loved how soft the conditioner made her hair, but said that it caused her to get body acne. That got me thinking. What if the skin problems I was facing was not to do with skincare but with the Tresemme conditioner I was using? I gave it a rave review previously, but I’d never thought it might affect the skin. My hair conditioner was finishing, so I decided to stop instead of restocking, just to see if my gut feeling was right. I went instead for Himalaya Herbals Protein Conditioner which I have also reviewed. Within 3 days of stopping my Tresemme conditioner, I realised I was not getting any new spots. Within a week, and with a little help from my trusty apple cider vinegar toner, my skin is now almost back to the way it was i.e. relatively smooth, with no new blemishes or spots. I’m very happy about that. However, it got me wondering about why the Tresemme conditioner would cause my skin to break out. I’ve never had a hair product do this to me before. It could be because I wash my hair everyday so I am exposed to the product a lot and something in it did not agree with me. Either way, I seem to have isolated the hair conditioner as the cause of my traumatic month-long battle with problem skin and I’m working on clearing it up now, with great success. Have you had a hair product break you out before?